Hirschman, son of defending champion Tony Hirschman, finished eighth in Ed Bennett’s #59 car. 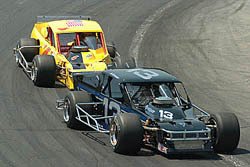 The first lap of the race was the first time that the young Hirschman had ever driven a competitive lap at Waterford. Pasteryak, a regular in Waterford’s SK Modified division, drove his father Charlie’s #5 ride and took home a finish of 20th. Speed51.com talked extensively with both drivers after the race, along with their fathers, And we will have a pair of stories on their maiden races coming soon. The wreck dropped Barry out on the spot and left him with a finish of 30th. This season has not been kind so far to last year’s Rookie of the Year. Barry is currently ranked 17th in points with one top 10 finish. His 2005 season has mostly been a matter of being in the wrong place at the wrong time so far. Donny Lia led all 150 laps of the race and won. On his final lap, the caution came out for Tony Hirschman’s wreck. Since Lia had already taken the white flag, the race went under yellow and no green-white-checkered finish would take place. That was a good thing for Lia since he car died going to the checkered flag. Tony Hirschman did not run in any position lower than fourth-place all night long. That was until lap 148 out of 150. That was when Hirschman’s #48 and Jerry Marquis’ #4 made slight contact with the #48 spinning into the turn three wall. The contact between the two cars might have been an easy hit, but the contact into the wall was not. 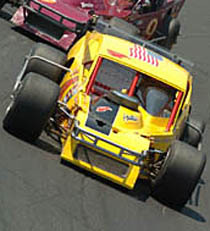 Hirschman ended up with a 12th-place finish. The spin occurred after Marquis appeared to be trying to make a pass on the outside. Civali doesn’t dispute the fact that he got into the back of Barry, but he doesn’t think that is was an avoidable incident. “It was one of those things,” said Civali. “He got held up by the #94 [Justin Gaydash] and he was really trying hard to get by him. I was making sure that I would stay with him when he made the move and I was trying to get him to go when coming off of four I guess he hit the #94. They stopped up quick and my front tire was in the rocks. The culprit? 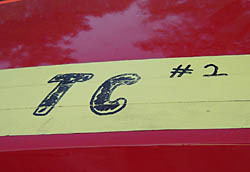 A safety device on his #18 car. “We run a safety device that replaces the basic throttle linkage. It’s got a kill switch in it. Our throttle linkage is real close to our air cleaner. We angled the air cleaner so it would clear. There can’t be any pressure on the linkage. It’s got a spring loaded trigger switch and if there is pressure on it, it will close just like there is a stuck throttle. Nevin George races by the wet infield. Hirschman was understandably unhappy after the race, but he knew that contact from another seasoned veteran probably wasn’t something that was by design. 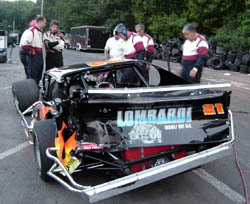 Meanwhile, things weren’t so cordial after sophomore driver Ken Barry got bumped by James Civali in his first Modified Tour start. The race was only 18 laps old when the two cars bumped going into turn four. Barry took a hard bounce off the frontstretch wall as a result. He was not very happy afterwards. Both drivers had a positive attitude after the race though. The incident caused a tense moment or two for Lia. 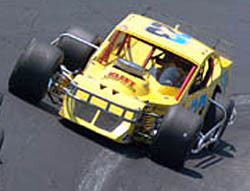 Ted Christopher and Zach Sylvester entered the Waterford race first and second in the standings respectively. They couldn’t have had more different nights either. Christopher finished a solid second and added to his lead. Sylvester got caught up in trouble and spent more than a dozen laps getting repaired. He finished the race in the 23rd position and dropped to fifth in the standings. The first two races of the season weren’t too kind though. 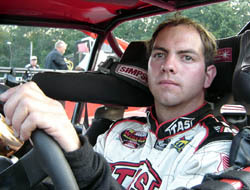 Marquis was shut out of the top ten in both the Thompson and Stafford races. Things are changing though. Marquis has a pair of fourth-place runs in the last two events. The first race is in the books for James Civali. He made his NASCAR Whelen Modified Tour debut and he finished. The former SK Modified driver got together early in the race with Ken Barry [see above], but stayed out of trouble for most of the night and finished on the lead lap in 16th. It might not have been spectacular, but it was a very solid and respectable finish at a tough place for a newbie. With his performances of late on the NASCAR Whelen Modified Tour, you would never know that Eric Beers hasn’t won a Tour event yet. He’s contended for the victory at both Riverhead and Waterford and has become a fixture out front. He also knows how to win elsewhere and is extremely competitive running RoC Modified events and local Mod shows near his Pennsylvania home. Is his first Tour win around the corner? You would also never know that Beers suffered multiple injuries in an April wreck at Thompson. He missed one Tour races, but since coming back has finished second and third. The scary thing is that he’s not completely back to normal yet. Another scary thing, for the competition at least, is that Beers will start first in the rain delayed race this coming weekend at Stafford. Jerry Marquis and the #4 Mystic Missile team know a thing or two about strong runs. Both have won a ton of Modified Tour races through the years. So when the two teamed up for the 2005 season, there were great expectations. probably won’t be at the track until later this season, but she helped to cheer her father on to a finish of tenth from the family’s Long Island home where Shivers’ wife missed a rare event to tend to the newest member of the family. With all of the rainouts that the Modified have had this season, it’s hard to keep track of what the schedule should be. 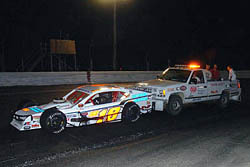 Events at Stafford and Thompson have been postponed while other races have been threatened or have barely gotten in. It’s hard to keep track of what has and hasn’t taken place. So when Justin Gaydash couldn’t tell for sure if he made his first Modified Tour race of the season at Waterford, it’s easy to understand how he could be a bit lost. Gaydash finished one lap down in 22nd. There were two drivers who Speed51.com didn’t catch up with after the race still deserve a mention and a big pat on the back. Steve Whitt ran strong all night at Waterford and finished fifth in the #06. Tommy Cravenho made his first start of the season by filling in for Mike Stefanik aboard the Brady Bunch #00. Cravenho finished seventh. 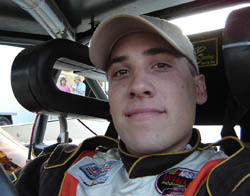 Stefanik was absent to race at Holland Speedway (NY) in the Busch North Series. The trip was well worth it for him, as he won his first Busch North event since 1998 in the event. The top 10 finish might help to turn Shivers’ racing luck around a little bit. 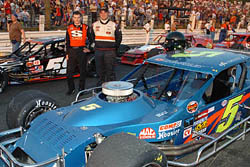 Also making their Tour debuts at Waterford were second generation drivers Matt Hirschman and Chris Pasteryak. The two qualified together on the sixth row and both stayed out of trouble and on the lead lap all night.